Recently, Silversea switched from relying on frozen ingredients to utilizing fresh locally sourced foodstuff whenever possible. This dramatic change positively impacts the overall dining scene; chefs are happier, the food tastes better and servers are more enthusiastic. The new healthier emphasis includes ingredients like chia and flax seeds and flavored olive oils on the luncheon buffet, and olive oil on tables throughout the ship, even the Pool Grill. Dinner in the Italian La Terrazza and in Le Champagne are cruise highlights. Service is excellent in all dining venues, but slowest at The Pool Grill at lunchtime. 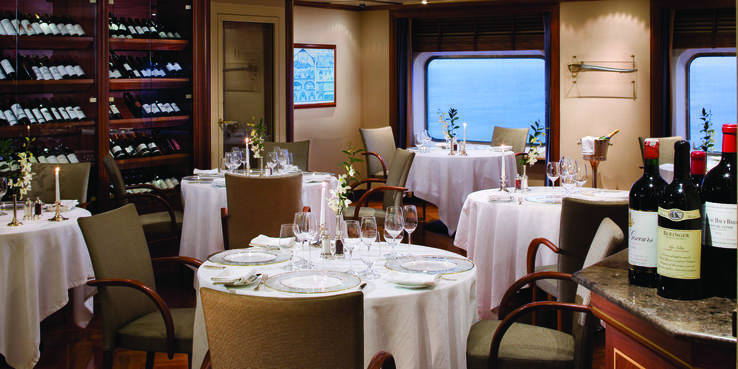 The Restaurant (Deck 4): This dining room smacks of timeless elegance. Crystal chandeliers shimmer. Softly striped formal curtains, lined with sheer panels, tie back to reveal ocean views from windows lining both sides of the room. (Window tables for two are highly coveted.) Recently sanded and re-polished parquet floors gleam. Tables are set with overlay cloths in creamy tones. The Restaurant serves breakfast, lunch and dinner and reservations are never needed. Dine as you wish, with fellow passengers or at tables for two. Tables for four are often converted to two, per passenger request. While the maitre d' always asks if you'd like to sit with others, he never makes you feel pressured. State upfront if you want a table for two nightly. Breakfast is served between 8 and 9:30 a.m. and is ordered from a menu. Expect choices like pancakes, waffles, egg dishes, Danish and other freshly baked pastries. English breakfast devotees adore scrambled eggs served with baked beans and grilled tomato. Lunch is served between noon and 1:30 p.m. The menu is substantial -- order up to three courses plus dessert. Dishes like crab and cherry tomato confit timbale, penne carbonara and whole-roasted Asian-style crusted pork loin are typical. You can find a sandwich, like grilled ham and cheese with french fries and greens. If the only salad available is appetizer-size, ask the chef to add chicken, seafood or beef for a main-course meal. A leisurely lunch here is most popular on sea days. When the weather's nice or passengers are busy with activities, most prefer dining more informally outdoors, at The Pool Grill or La Terrazza. Dinner is served between 7 and 9:30 p.m. The Restaurant feels far fancier come nightfall. Lights are dimmed, curtains are closed. Tables are set with dressier china and more delicate stemware. On formal nights, musicians play classic songs. The expansive menu always features crudo (raw marinated, usually seafood), like scallops or beef carpaccio, soup such as frothy cauliflower, salad, pasta like fusilli mascarpone with mushrooms, seafood such as crayfish-stuffed baby squid, and premium meats. Two gourmet hamburgers, including hickory-infused with taleggio cheese and polenta fries, are new-ish staples. (We're not convinced burgers, even if they are luxe, belong on the fine-dining menu.) Most passengers order three or four courses plus dessert. Europeans often finish with a cheese course; the menu features 10 selections, many from France. Vegetarians can choose between two sophisticated entrees. Menu staples, like grilled salmon, chicken and steak, are always available. With advance notice, the chef will prepare any dish you like if the ingredients are available. Knowledgeable sommeliers bring complimentary red and white wines to each table and readily refill glasses. These wines gallop the globe, and include fine labels as Chateau Les Tuileries Bordeaux. If you don't like the evening selections, ask for another complimentary choice. Wines are good enough to avoid spending extra on the Connoisseurs List, unless your budget is limitless or you're celebrating a special occasion. The dessert menu accentuates gelato -- don't miss the Sicilian pistachio or Italian almond. Italian frozen yogurt marbled with whole fruit (bitter orange delights), stands out, too, and the froufrou pastries are as chic as any in a Manhattan bistro. La Terrazza (Deck 7): La Terrazza's indoor-outdoor design showcases gorgeous sea views with floor-to-ceiling windows on three sides of the room. Inside, fine linens top tables, and columns with brass accents and teak rails subtly divide the space into more intimate alcoves. A stunning oval-shaped stained glass light fixture shines overhead. Outdoors on the patio, a cream-colored awning shades teak tables of varying sizes. On beautiful days, these tables are packed. The breakfast and lunch buffets are presented in a separate annex, so dining feels unhurried and uncrowded. Reservations are only necessary at dinner. A breakfast buffet is served between 7:30 and 10 a.m., with egg dishes requested from your server and cooked to order. The buffet is well presented, with neatly arranged food on attractive platters kept immaculate by watchful cooks. Help yourself to fresh fruit, yogurt, cheeses and primo cold cuts, and sides like hash browns and grilled tomatoes. Freshly baked breads, croissants and Danish abound. Servers insist on carrying plates to your table, even if you're only holding a small fruit bowl. They refill water and coffee, clear plates and happily retrieve an extra Danish from the buffet. La Terrazza is the most popular morning dining venue, particularly on shore excursion days. A diversified lunch buffet is served between noon and 2 p.m. More passengers enjoy dining here rather than The Restaurant; it's less formal plus it's faster on shore excursion days. Staff stands behind counters to assist and serve. The spread is prettily laid-out, at varying heights, on attractive platters and with signage. An array of sophisticated salads, from duck to vegetarian, plus sandwiches are always displayed. Many ingredients, such as artichoke hearts, capers, pumpkin and pine nuts, and seeds like chia and flax, may inspire your own leafy creation. Splash one of eight flavored extra-virgin olive oils, such as lemongrass-infused, on your greens. Sushi and sashimi, such as salmon or vegetable rolls, are fashioned daily, too. A quiche of the day and two freshly baked thin-crust pizzas, like seafood or mushroom, also await -- or order a personalized pie from the tableside menu of 10 choices. The pizzas are uniformly good. At the carving station, a cook slices moist roast turkey, pork loin or juicy beef to order. Other hot dishes vary from dim sum and Indian biryani, to fish and vegetable gratins. Rather than taste cafeteria-ish, these dishes, made in small batches, possess finesse. The cheese display excels, often including a fine French blue or English Stilton. Expect a wide array of gluten-free and sugar-free desserts, plus ice cream, pastries such as opera cake, and American cookies like oatmeal raisin and chocolate chunk. An Italian sit-down dinner is served between 7 and 9:30 p.m.. The setting is far lovelier at night. The buffet annex is closed, lights are dimmed and passengers are only seated by or near the windows, or on the outdoor patio. Dinner is by candlelight and served on more elegant dinnerware than at lunch. The restaurant is booked only until it's half-full, so make reservations ahead. The evening menu changes every three days and housemade pasta -- particularly a signature duck ragout -- is always a knockout. The exemplary breadbasket tempts with bulbs of roasted garlic and freshly baked herb-scented focaccia. The noteworthy antipasti plate includes arancini (rice balls), anchovies and robust Parmesan. Lamb chops with deep-fried leeks and sliced striploin of beef with port wine sauce are terrific. Complimentary Italian wines, like Luccarelli Puglia Primitivo, are always good and servers are quick to refill glasses or open another complimentary bottle if you're not satisfied. Tiramisu and panna cotta are dessert standouts. Le Champagne (Deck 7); $40: Le Champagne is the only Relais & Chateaux (an upscale collection of hotels and restaurants worldwide, renowned for its cuisine) restaurant at sea. It's also the most romantic dining room onboard, and Silver Shadow's only extra-fee restaurant. This is a couples' haunt, with just seven candlelit tables for duos who come to whisper and hold hands. Fine art celebrating food and drink hang on walls; sleek glass cases display haute wine bottles. Two picture windows provide ocean views. Chairs sport plush royal blue upholstery. Posh chargers, rimmed with black and gold, rest on creamy linen tablecloths. The delicious menu showcases fancy French multicourse meals with wine pairings and is served between 7 and 9 p.m. Luxury ingredients -- like caviar with buckwheat blinis, foie gras mousse in cones or terrines and lobster as in a spectacular bisque or Thermidor -- take center stage. Edible gold leaf risotto is decadently good. Lovely complimentary wines include Champagne Monopole Heidsieck Brut and Tenuta Sant'Antonio Sponsa. Meander through five courses or so and relish on-point servers rushing airy Grand Marnier souffles to your table. Even though dinner costs $40 per person, it's extremely popular, so make reservations as soon as you book your cruise. The Pool Grill (Deck 8): The poolside alfresco grill is open for lunch between noon and 3:30 p.m. and dinner between 7 and 10 p.m. This isn't your basic greasy burger counter. Grab a seat at one of the Formica-topped tables with rattan-style powder-coated aluminum chairs lining the deck. Even the napkins are fancy -- fine linen rather than paper. There's no waiting in line; servers take all orders. Olive oil and balsamic vinegar cruets, plus a dual grinder of Himalayan pink salt and black peppercorns, grace each table. One side of The Pool Grill is reserved for smokers. At lunchtime, choices include fresh grilled fish of the day, salads like caramelized fig and goat cheese and the ever-popular Black Angus burgers and sliders. Housemade Ronnefeldt-flavored ice teas and cocktails are poured. Come dinnertime, the eatery is simply called The Grill and serves Americana classics with hot rock dining. Servers deliver tortilla chips, guacamole and salsa while you decide between entrees like steaks, veal chops and giant Madagascar prawns. (The prawns are divine.) Entrees arrive sizzling on a heated volcanic stone and you take over the cooking. (If you don't want to, the chef can do it. But know that they cook entrees on a flattop rather than hot rocks, which negatively impacts the flavor.) Sides are eggplant, tomato and zucchini skewers, and a surprisingly good baked potato with all the trimmings. Dessert includes apple pie with vanilla ice cream. It's divine to dine under the stars with that gentle ocean breeze. Plus, there's no dressing up. Panorama Lounge (Deck 8): This all-purpose lounge offers Early Risers coffee and pastries from 6:30 to 10 a.m., and bouillon from 11 a.m. until noon. Tea service is offered daily -- between 4 and 5 p.m. -- and it's impressive. Select from about 20 Ronnefeldt teas, from black and green tea to wild cherry organic. Loose leaves brew in pots while servers present assorted freshly baked scones, tea sandwiches and tiny pastries. It's all quite proper and very fun. Room Service: Complimentary in-suite dining is available 24 hours a day. Breakfast can be ordered the night before by 2 a.m. Although breakfast is served between 6 and 10 a.m., with advance notice, butlers bring what you want whenever you want. Breakfast beverage choices include cappuccinos and English tea, daily fruit or vegetable Vitamix drink and juices such as orange, and pineapple and the now-rare prune juice. Pour real maple syrup over banana pancakes or waffles with ripe strawberries and freshly whipped cream. Eggs can be cooked any style with American, English and Canadian bacon among the meaty sides. Healthful choices include egg white omelets with spinach, yogurt and multigrain fresh juice-sweetened muffins. Lunch and dinner include sandwiches like triple-decker club, salads such as chicken Caesar and grilled New York sirloin steak. Pastas, such as homemade linguine with pesto, are consistently good. When The Restaurant is open, you may also order off its menus (but not from other dining venues). While some canapes and snacks, like guacamole, are complimentary, Silver Shadow offers four types of Calvisius caviar with homemade buckwheat blinis and condiments at market price. (The menu is tucked discreetly in a desk folder.) Selections include California white sturgeon roe and Adriatic sturgeon caviar from Italy. Passengers can enjoy afternoon tea in-suite. Choose from five varieties of freshly brewed tea, finger sandwiches like smoked salmon and cream cheese, tiny pastries and cookies, and scones such as buttermilk with clotted cream. Butlers deliver all meals and set tables properly with fine linen and polished silverware. Dinner is served course-by-course. Butlers quickly learn passenger habits; for example, they start bringing an extra cappuccino when they note you always call back for a second.